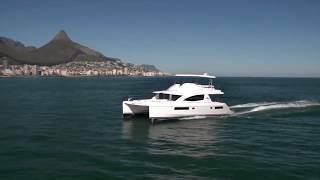 The Leopard 51 Powercat brings with it a multitude of exciting features, including a sleek design, a large forward cockpit, additional lounging areas, an expansive flybridge and a completely redesigned interior upgraded with modern appliances. This yacht also boasts a large and open saloon, a galley with the latest appliances, and a 3 or 4 cabin layout with en-suite heads. The Leopard 51 Powercat combines the best from our sailing fleet with the luxury and ease of a power yacht.